No, not enchant enchantments. (Though now that you mention it, I have a few card design holes to fill. . . .) It's feedback! Over the past 25 years, we've slowly learned that a major secret to success is listening to what players have to say and trying to address their concerns. I know it may seem like a no-brainer to use the revolutionary strategy of "Give people what they're asking for," but it really is crucial for us. What you say matters! We've adopted this time and time again with card sets. Players liked Invasion, a "gold" set (meaning it had a multicolor theme). 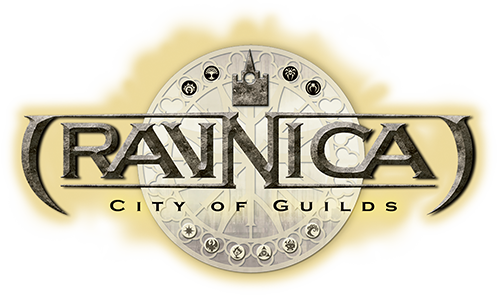 That meant we knew we should try it again, which led to Ravnica—one of our most beloved worlds ever. Innistrad was a flavorful, top-down world that was incredibly popular. As a result, we started incorporating flavor and top-down resonance into almost every plane we visit. And most recently, with Dominaria, you've said for years you want to return, so we went back. And if early signs are any indication, it's going to be wildly successful. And this kind of feedback has evolved quite a bit. 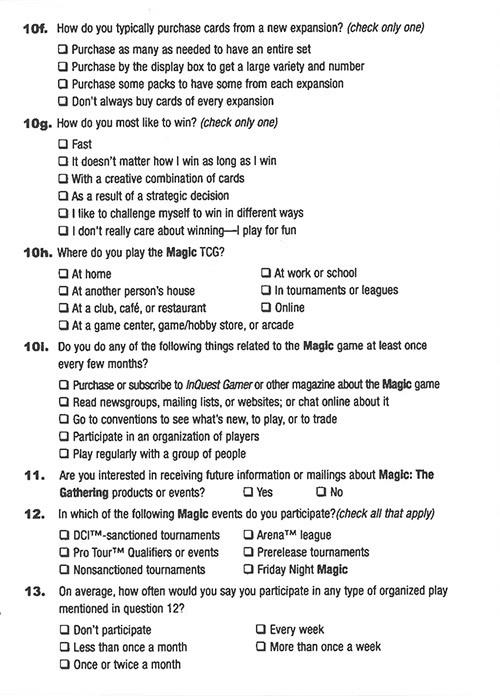 It used to be—as some of you may remember—that when you bought tournament packs (an old product used for Sealed Deck events), inside you'd find a little paper insert asking you to write down your feedback on the set and mail it back to Wizards. In the current day and age, the feedback process has been supercharged by social media. Now, instead of filling out paper feedback forms and submitting them as hand-delivered pieces of mail, sending us what you think is just a tweet away. These feedback loops are becoming faster than ever; instead of waiting weeks or months to hear what players think about something, we can hear what you initially think of a set literally seconds after an announcement. For example, we've received a ton of important feedback about the cards in Iconic Masters and Masters 25, which is already having a strong impact on our future plans. In today's world, we need to be nimble. We need to be willing to adapt quickly and pivot. And while we still can't go back and change cards after they're released—though if you have a time machine, go back and let me know about it before I write this article—we can try and get a lot quicker with it and run trials to learn how to make it better beforehand. Okay, okay, so what is this all boiling down to? What on earth is Grandpa Gavin getting at here? Well, whippersnapper, it's this: we use this philosophy when working on our product types as well. I separate product design into four eras. For example, in 2006, if you were a Magic player and wanted to get cards in paper, there were four things you could buy: Guildpact, Dissension, Coldsnap, and Time Spiral (and the products associated with them). That's literally it. No Masters. No Archenemy. No Commander. That's all there was. I call this "The Expansion Era." Because really, that's all there was—expansion sets. So what changed in 2007? The schedule looked very similar. In paper, we released Planar Chaos, Future Sight, Tenth Edition, and Lorwyn. And this is where the second era begins, "The Deck Era." 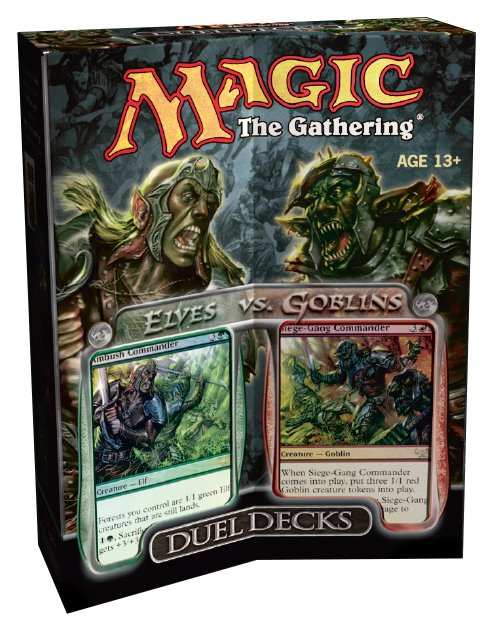 The very first Duel Decks release, Elves vs. Goblins, is what, in my mind, kicked this whole thing off. The success of that product opened the floodgates for not only future Duel Decks, but also From the Vault, Planechase, Archenemy, Commander, and far more. These all contained cards that weren't Standard-legal, some of them had new cards, and many contained alternate ways of playing Magic. These were all preconstructed decks, and quite popular. Eventually, it expanded into the third era: "The Draft Era." 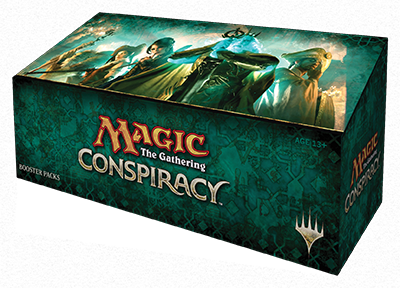 This started with Modern Masters, and hot on its heels was Conspiracy. 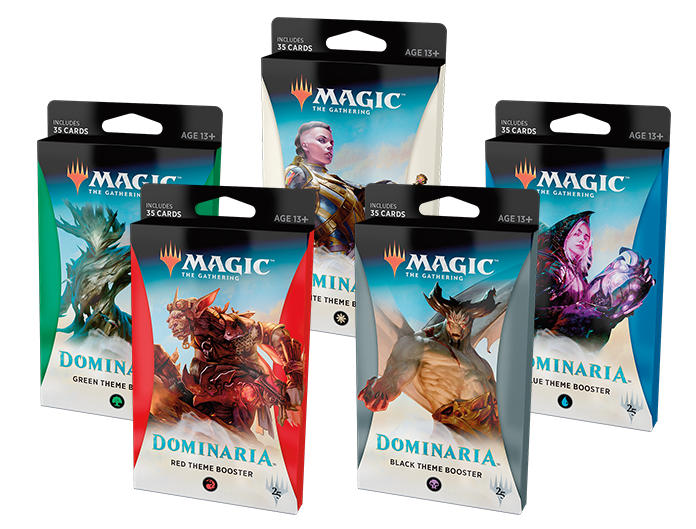 These are fully draftable products, full of unique cards players wanted for casual play as well as Eternal formats. That was a brand-new thing for paper! (Magic Online pioneered them a bit with Masters Edition releases.) And now these are cornerstones of your Magic year. Players wonder what the innovation booster release each year will be. I say this because as I tell you about the fourth era, it's important to know that we're not going to stop doing anything from the previous eras. In fact, this exciting fourth era relates very strongly to the previous three! So, what is the fourth era? I call it "The Feedback Era." As noted before, we really value feedback—and we want to use it to make our products better. But, you might be wondering, "Of course you always use feedback to make decisions. What's different now?" The difference now is that we are doing tests of different products to see how they'll be received. What do I mean? There are a few different ways we can implement this. These Challenger Decks were something new for us: a powerful, ready to play out of the box, competitive Standard deck. And, though they've been a big hit, we truly weren't entirely sure how players were going to react to them before we released them. This is a very simple version of us testing a product: we just released it, knowing that based on the results we would consider if and how to do it again next time. To make this all possible, we altered all our schedules around the decks so that we could release them quickly—as they need to be available in the current metagame to remain competitive decklists—and give ourselves plenty of runway in case we wanted to do more. 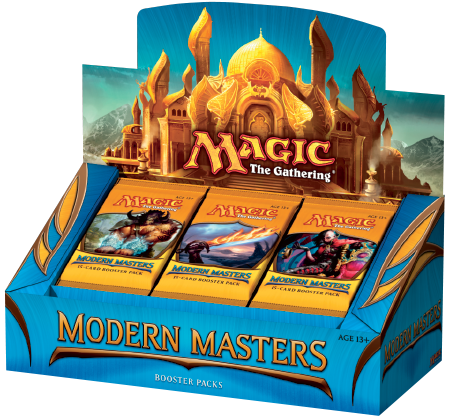 Often it takes us eighteen months from deciding to do an ancillary product like Challenger Decks to actually releasing it in stores—but with this product, that simply wouldn't do. So we decided to change a lot of our process to make it work. That's one kind of test. Another great example is what we did with Brawl. Brawl we released to the world with the note that we were still looking at tweaking and modifying the format further. Unlike, say, announcing Modern for the very first time, with Brawl (like I talk about in my article) we're looking to user feedback to make changes. And it's true! In the past month and a half, we've heard a lot of very useful feedback. You've told me about your preferences for multiplayer versus one-on-one play. About cards you think are too strong. About the difficulty of playing Karn. About rotating. About how you wish there were Brawl decks you could buy. About so many things! Additionally, we're using user research here as well. We're putting surveys out there to capture all sorts of feedback on Brawl. If you have thoughts about Brawl and see a survey, please take it! We want to make sure to get data from all kinds of people. Okay, so that's two kinds of tests. But there's a big kind of test we're doing, and it's perhaps the newest. And this is, to me, what really heralds this era. Starting in this era, we're trying some things out in small, targeted markets before releasing them more widely. We want to see how they're received, get feedback, and then make decisions about whether to do them on a large scale or not. This helps make sure that we aren't filling our calendar with tons and tons of products when we aren't sure how they will do (we've certainly heard a lot of feedback about our high number of releases in the past year) and also helps us make our products as great as they can be. This is something new we're trying with Dominaria, in a few hundred Walmart stores. These are theme boosters! This is a new take on a booster pack. It's not meant to replace regular booster packs at all, so have no fear about that. It's a new kind of pack. There are five of them, one for each color. These are targeted at players who are building a collection and simply want to ensure they get cards their favorite color deck can play. 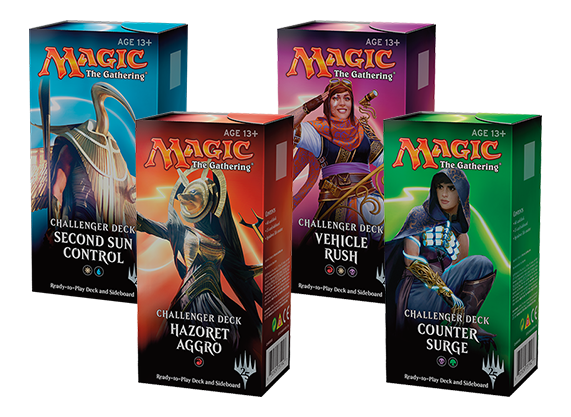 Each pack contains 35 cards you can play in a deck of that color. (So, in the blue one, you can only open blue cards, artifacts, and lands . . . okay, and Karn.) You can open up rares and mythic rares in these packs, as normal. (And sometimes, you'll even get two!) Unlike normal boosters, there is no set common-to-uncommon ratio: one pack might have six uncommons and the next one ten. But the real exciting thing to me is how we've done the card collation. We worked on the collation so that there are small themes that give you deck-building hooks among the commons and uncommons. For example, in the white theme booster, if you open Danitha Capashen, Paragon, you will also open Auras and Equipment to go with her. These mini themes can inspire someone, especially a newer or more casual player, to build up entirely new kinds of decks, and each pack is full of several of these mini themes. However, this is all still done fairly randomly—and your rare or mythic rare always appears independent of the themes inside, so you can really get anything. Plus, there's always just my favorite way to play with these: find a friend, each buy one, shuffle in 25 lands of the appropriate color, don't look at the cards, and battle! We really want feedback on what players think of these, so we're doing a small release here. If it goes over well, we can add them to the product lineup for all game stores come "Spaghetti" this fall and take lessons from here to make tweaks before then. This is something kind of new for us to do. But by doing small-scale tests like this, we can learn a lot about what will work on a larger scale. So if you see a new product like this show up near you—well, that's what is going on. If there's one thing I hope you take away from this article, it's this: give us your feedback! What you say really matters. And the number of times I've tweaked a card in a set or modified some product off of a suggestion or an idea that was brought up in feedbacking is too high to count. So please, let me know what you think about anything and everything. Constructive feedback is always welcome. Do you want to deliver some of that feedback? Feel free to contact me by sending me a tweet, asking me a question on my Tumblr, or emailing me at BeyondBasicsMagic@gmail.com. And who knows, maybe it'll be what you say that impacts something we're doing next. I'd love to know what you think about our current product mix, what you like and don't like, and especially what you think about things we're trying like Challenger Decks, Brawl, and theme boosters. Is something missing that you wish existed? Part of listening to feedback is figuring out what doesn't exist that players are asking for. So please, let me know about that too! I hope this was a useful look at what we're making, how we make it, and how your feedback shapes what we do. To me, this is really a crucial cornerstone of what we do—and how we do it.